Best I can tell, it looks new. I believe the red lanyard was removed so my mom could wear it as a pin, but never got a chance to. It has sat in a closet, so just a little bit of tarnish. 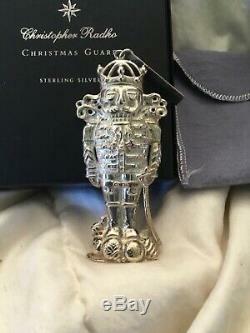 Beautiful, heavy piece of sterling silver made beautifully into a Christmas Guard. Made in 1999, weighs 53.1 grams and measures 3 3/4 inches by 1 3/4 inches. 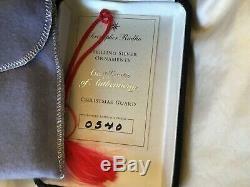 Comes with the original outer box, display box, certificate of authenticity (number 540). If you need more photos, or of something specific in reference to this piece, please contact me. Feel free to ask any questions about this item. ALL ITEMS COME FROM A CLEAN, NON-SMOKING HOME but I do have a dog. This is a great system if we all follow the rules and play nice. Thank you for your understanding! Please check back for more items. 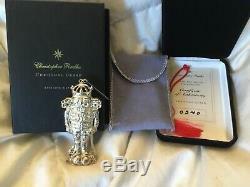 The item "1999 Christopher Radko Christmas Guard Sterling Silver Pin And/Or Ornament #540" is in sale since Sunday, March 31, 2019. This item is in the category "Collectibles\Holiday & Seasonal\Christmas\ Current (1991-Now)\Ornaments\Other Current Tree Ornaments". 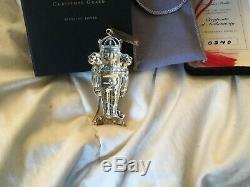 The seller is "av8-navig8" and is located in Frazier Park, California. This item can be shipped to United States, Canada, United Kingdom, Denmark, Romania, Slovakia, Bulgaria, Czech republic, Finland, Hungary, Latvia, Lithuania, Malta, Estonia, Australia, Greece, Portugal, Cyprus, Slovenia, Japan, China, Sweden, South Korea, Indonesia, Taiwan, South africa, Thailand, Belgium, France, Hong Kong, Ireland, Netherlands, Poland, Spain, Italy, Germany, Austria, Bahamas, Israel, Mexico, New Zealand, Philippines, Singapore, Switzerland, Norway, Saudi arabia, Ukraine, United arab emirates, Qatar, Kuwait, Bahrain, Croatia, Malaysia, Brazil, Chile, Colombia, Costa rica, Panama, Trinidad and tobago, Guatemala, Honduras, Jamaica, Antigua and barbuda, Aruba, Belize, Dominica, Grenada, Saint kitts and nevis, Saint lucia, Montserrat, Turks and caicos islands, Barbados, Bangladesh, Bermuda, Brunei darussalam, Bolivia, Ecuador, Egypt, French guiana, Guernsey, Gibraltar, Guadeloupe, Iceland, Jersey, Jordan, Cambodia, Cayman islands, Liechtenstein, Sri lanka, Luxembourg, Monaco, Macao, Martinique, Maldives, Nicaragua, Oman, Peru, Pakistan, Paraguay, Reunion, Viet nam, Uruguay.